Me with my brain juice. Amy is really not impressed. If there's one thing I'm good at, it's getting myself into scrapes. A combination of clumsiness, idiocy and allergy means that if anyone is going to end up in a foreign hospital, it'll be me. Luckily, I only seem to do this when I'm travelling with friends. So far (and I'll pause here to touch every piece of wood there is in sight) I've avoided catastrophe when I've been alone. This means, unfortunately, that my friends have seen the inside of far too many A&E departments. Which is as good a point as any to explain the picture above. It was taken in London, after a night meeting some old friends. Gareth was away in the navy at this point (he lives in Florida now) so we didn't see him that much. I was over in London for a long weekend, and we met up with Amy and Alicia for a few drinks. When the time came to say goodbye, we all had a hug on Tooley Street. I was heading to London Bridge, to get the last train home before my hideously early flight the next morning, Gareth was staying in town, and Amy and Alicia were heading home, as they had a big day at work ahead of them, with a very early start. If there's one person a little clumsier than me, it might be Gareth. So when the forces combine, it can be a little messy. Gareth leaned forwards to give me a hug goodbye, and caught me off guard. I, being the poorly balanced mess of a human that I am, fell backwards into the street. The next thing I remember is walking down the road, feeling the back of my head and asking Amy "Is your head wet? Mine's quite wet" before bringing my hand in front of my face and looking at quite a substantial amount of blood. 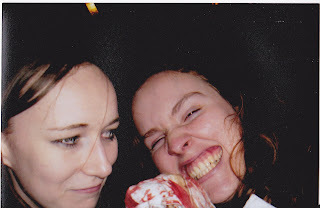 At some stage, I found the whole thing hilarious and wanted a picture of me and my bloody hanky. Which explains the photo. Next stop - St Thomas Hospital, Waterloo. I had a finger prick from the nurse on reception. Now, you'll probably remember that earlier in the evening, a few drinks were taken. And you might think of me as one of those people from 24 Hours in A&E - a drunken langer with a head injury. But I swear to you, I wasn't drunk. I was horribly concussed. The trouble is, the two look awfully similar. And as the nurse saw I had some wine in my system, she probably thought I was more drunk than anything. Which is why we were sat in A&E for about 5 hours. I went from giggly to weepy about 23 times. God bless Amy and Alicia - they must have been counting down the amount of sleep they would get before their big day. At somewhere around 4am, I was seen. Oddly, I wasn't given stitches or anything, just a bit of a hair snip and gauze. Luckily I had the brain power left to think about how I was going to get to Gatwick for my flight home. My passport, luggage, everything was back with my mum. So I decided to get the train to Haywards Heath, meet my mum there at 6am, turn straight back around to Gatwick and get on my plane. I had a bit of time to kill before the first train, so I chose to wander up and down London Bridge, crying gently. I was covered in blood, which had soaked the back of my jacket and the front of my pure white top. In short - I LOOKED BATSHIT INSANE. At some point, I slumped on the floor in London Bridge station. You might think it a little odd that no one came to ask if I was OK, as I lay bloody and weeping on the floor. You would be right. I mean, I did look a little crazy. But I think I would go and check on someone in that condition. Anyway. I got the train. I met my mum. I got another train. I got to Gatwick. I walked through security, check in and boarded still covered in blood and crying. The air stewardess came to talk me through the emergency procedures (I was sat in the exit aisle) and asked no questions. That airline went out of business, by the way. If I had been flying Aer Lingus, they would have cradled me to sleep in their arms. Ryanair would have charged me extra for bleeding on the seats. I got back to Knock, and my friend picked me up. At this stage, things were falling apart slightly. The cabin pressure had near exploded my brain, I was exhausted, in pain and had no idea what had happened. Vague memories were coming back to me, but I could only piece them together. My mum had called him and left a message about what state I was in, but he didn't really understand it. So when I fell into his car it all came out in a slightly confused, bloody jumble. But I got home, went to the doctor who cleaned up the mess that A&E had left me in, and I ate some soup. Then I went to sleep. All was well. Always, always make sure you have medical insurance. This happened in the UK, so it was all fine, but in many other countries that could have been an expensive accident. If you're travelling within the EU, get an EHIC card, which gives you access to medical treatment. Otherwise, double check your travel insurance before you go. If you're going to crack your head open in the street, do so when you have two friends with you who will accompany you to many hospitals through the night. Never wear white clothing. Just in case.